Lights bright amber behind a clear or amber lens. For use in amber or white flashing indicators. Can also be used for stop lamps, fog lamps and reversing lamps. Why trafficate when you can FLASHICATE! Very bright low power consumption 36mm long amber LED festoon bulbs with a difference. 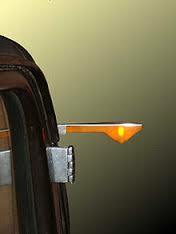 When the trafficator arm is raised, the bulb lights amber on both sides and flashes! No separate flasher unit required. A straight swap for your old bulb. They will work on negative or positive earth vehicles. A must have if using trafficators on todays roads especially after dark. 6v and 12v 31mm to suit Bosch, SWF and SHO trafficators as fitted to VW's etc. 36mm type have 6mm or 7mm end caps. 6mm caps have flat or pointed ends. 7mm caps have pointed ends. See also our Flashicator window sticker below. Very bright low power consumption 6v or 12v 36mm longamber LED festoon bulbs with 7mm caps. Use to make your trafficators brighter. Can be used where trafficators work with flashing indicators or made to flash with flashing indicators if the trafficator internal wiring is suitably altered. Tells following drivers (especially the younger generation who only recognise a flashing amber light as a turn signal) that you are not using conventional flashing indicators. Draws attention to and warns of the fact that you are using not just trafficators but flashing trafficators. Reverse printed so it sticks inside the rear screen facing rearwards. 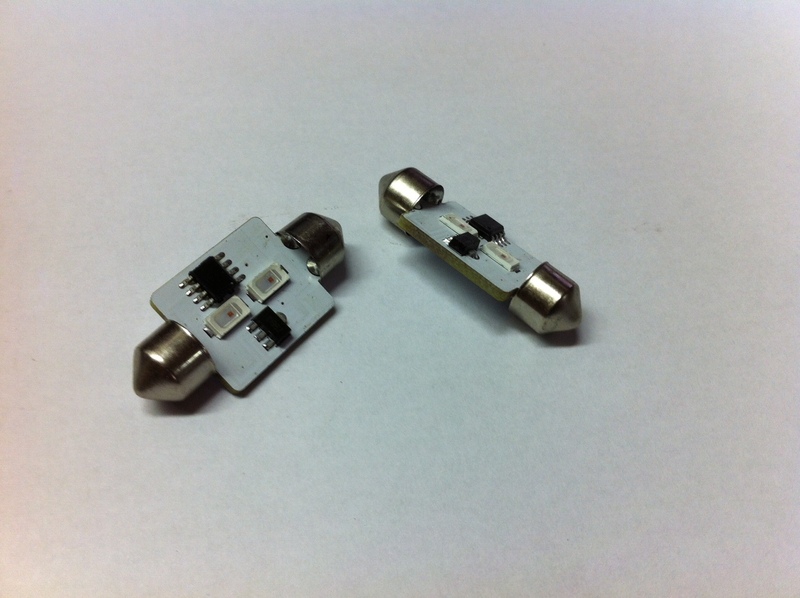 These handy little sounders emit a continuous 94db beep when a voltage between 5v and 24v is applied. When connected alongside or in place of your indicator tell tale(s) they provide an audible warning that your indicators are on by beeping with every flash. Gives a bright amber light for flashing indicators. Converts Lucas 539, 594, 691 and 794 and many others to LED operation. Can be used behind a white or amber lens to give an amber flasher. Available in 6v or 12v, negative or positive earth. Can be bedded on silicon in tight spaces. 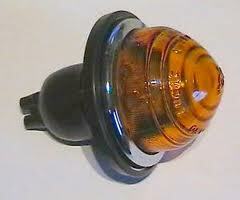 You've fitted LED indicator bulbs and a 2 pin flasher unit to your car or motorcycle. Everything worked fine with the original bulbs but now when you put the indicators on they all flash like hazard warning lights. This is because the new LED bulbs require so little current that the tell-tale bulb passes enough to flash all indicators at once. A clever little buzzer with just 3 wires to connect. Sounds when left or right indicators are used. Putting your foot on the brake (such as when waiting at traffic lights or a T junction) cancels the buzzer but still allows the indicators to flash. Release the brake pedal and the buzzer sounds again reminding you to cancel your indicators. No more leaving your indicators on after a turn. Same as part number 8 but including a Durite green tell-tale light. A simple way of adding discreet indicator, side or stop/tail lights to any vintage or classic car. Small enough to fit under wings or bumpers etc. then choose BA15s, BA15d or BAY15d holders. Choose your required bulbs from elsewhere in the shop. Fitted with a handy (removable) steel mounting bracket. Sold in pairs or in sets of four. 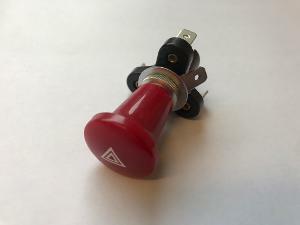 Our simple to fit hazard warning light switch kit means you can retro fit hazard warning lights to ANY vintage or classic car that's been converted to LED indicators or has a mix of LED and filament bulbs. No complicated extra wiring or heavy duty flasher relay required. Wiring diagram and instructions included. Suits 6v or 12v vehicles.